Be sure to stop by every Friday for the latest Quote of the Week or subscribe to Steph's Stacks to get the latest scoop delivered directly to your inbox! Feel free to follow Steph's Stacks "That What She Said" Pinterest Board for more bookish quotes from around the web. This week, J.K. Rowling (of Harry Potter fame in case you are new to books) celebrated a birthday. Given recent events, I thought featuring this particular quote would be ideal. Rumors abounded that The Cuckoo's Calling's publisher or Rowling herself were behind the leak in an effort to boost book sales. Eventually, it was discovered that the secret was revealed through a combination of investigative reporting (The Sunday Times) and a loose-lipped friend (Judith Calegarri) of one her publisher's lawyers (Chris Gossage of Russells Law Firm). Gossage issued an apology and probably dropped Calegarri, who clearly had never heard the phrase "Snitches get stitches." Rowling, after winning a swift lawsuit against Russells Law Firm, announced her intention to donate her winnings as well as 100% of The Cuckoo's Calling's royalties to The Soldiers' Charity. I, for one, was so pleased to know that Rowling wasn't behind the leak and am also impressed with her handling of the situation. I think it is so interesting that she is experimenting with writing different genres and I hope she continues to do so. The Cuckoo's Calling's pre-scandal sales were paltry, but the reviews were great, which may be as much a testament to the marketing side of book-selling as anything else. Obviously, sales and pre-orders have now gone through the roof as people are clamoring to get their hands it. 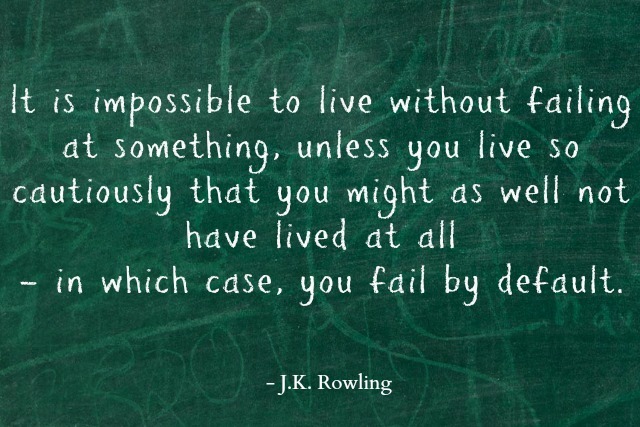 So, here's to you, Jo Rowling! Happy birthday and here's hoping you will continue to live boldly and find a cool new nom de plume! I wasn't very thrilled about The Casual Vacancy, JKR's entree into adult fiction. In fact, it wasn't my thing at all. I couldn't even finish it. But with The Cuckoo's Calling JKR's done it again. She's brought back the warmth I always associated with Hogwarts in this solid muggle detective story! The writing is BRILLIANT- with lines I found myself highlighting and smiling at. I love the quirkiness in her descriptions and how well fleshed out the characters were. Their accents, their airs, the mannerisms- all so beautifully captured, just like she did in Potter! The main character is this stand-up guy whose back story reminded me a lot of Dr. Watson from Sherlock Holmes! His secretary, Robin, made a great partner-in-crime-solving(?)! I do hope we see more and more of her. YES, there is more. This is only the first book in a series and I'm already waiting for the next book! It's also a pretty good mystery. I couldn't solve this whodunnit till the very end of the book when I was surprised to find out who the murderer was. The Cuckoo's Calling, plot-wise, is NOTHING like Harry Potter. It's an adult detective novel, for godssake. BUT it comes closest to being as warm, as amazing, as engrossing and as much of a treat as a Potter novel! The characters leap out of the page! Even better, since it's an adult novel, the characters don't hold back at all! The mystery is tightly knit, hard to solve! Descriptions of food- even if it's Pot Noodle and sticky toffee pudding rather than pumpkin juice, chocolate frogs and treacle tart- will make your mouth water. When you near the end, you will feel yourself slowing down, not because you're bored but because you don't want it to end. An all too familiar feeling, isn't it? I can't wait to read it. I set The Casual Vacancy aside because it didn't grab me or I got distracted by something else. The Cuckoo's Calling sounds right up my alley. I love trying to figure mysteries out and love it even more when they surprise me! I wonder if Rowling will keep at it with this genre? It sounds like she should! Always love his quote dan also his novel, what is your best novel author by Jk Rowling?